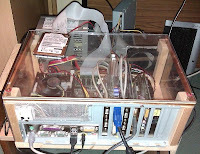 You may have heard reference on the podcast to my antique Pentium-4 'test' box, the 'Home Improvement' -style PC that's so non-branded it doesn't even have a case. Thanks to the placement of phone sockets in my house, wireless networking is essential, but the P-4 has no built-in wireless, cards or PCI-Express slots. NDIS is short for the “Network Driver Interface Specification” which was created to define a standard API for Network Interface Cards (NIC's). In order to get the card's hardware to work, you need a Media Access Controller (MAC) device driver to translate networking commands across the programming interface. Such is the diversity of manufacturers, chipsets and versions, in our world of GNU/Linux, native drivers just don't exist for every card and the nearest Linux equivalent may not work at speed. Fortunately, NDIS also provides a library of functions (commonly called a “wrapper”) that can be used by MAC drivers and higher-level protocol drivers such as TCP/IP. This is the NDIS-Wrapper that we'll use to get the manufacturer's Windows drivers to work. You can find out more at http://www.ndis.com/. ndiswrapper-common – implements Windows kernel API and NDIS (Network Driver Interface Specification) API within your Linux kernel, which allows you to run wrapper scripts to call out to the proper versions of whatever -ndiswrappper-utils package is installed. ndisgtk - this is the gtk graphical user interface for managing windows wireless drivers, for people like me who avoid terminal sessions whenever there's an easier way. Plugging the Belkin into the PC, I got a flashing light right away to indicate that the PC recognised the USB dongle by polling. With the Belkin drivers CD inserted, I then go to System -> Admin -> Wireless Network Drivers, selecting Install New Driver and browsing the CD to the .inf file which describes the driver for the specific chipset. Belkin in this case used a Ralink chipset, the RT73. More recent versions of drivers downloadable from the internet can be more reliable, robust and/or faster. Some Windows drivers are in two parts. 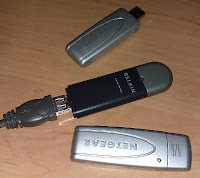 I have a couple of Netgear WG111T dongles which require both the Atheros firmware driver for the chipset (athfwwdl.inf) and a specific Netgear implementation driver (ntgwg11t.inf) in order to work. Why am I not using these? The antenna is so bad on that model, it won't even detect my router downstairs (sigh again). Upon installation, Wireless Wireless Drivers listed under 'Currently Installed Drivers' the RT73 chipset driver with 'Hardware Present: yes'. which indicated Windows Wireless Drivers had already done it for me. Just to make sure everything loads properly with no driver conflicts - and being an optimist - I rebooted here. which confirmed it can see the wireless network on wlan0 at decent signal strength. We don't care about lo (Loopback) or eth0 (wired ethernet) in this case. So I visited System -> Admin -> Network to start Network Manager to manually select the wireless “MY_HOME” network and entered my WPA-PSK security key. Network Manager took care of the connection. With my network credentials stored in my default Keyring, the Belkin automatically connects from this point on with good transfer speeds. Lab machine specs: Pentium-4, 2.14GHz, 1Gb RAM, 40Gb HD, NVidia GT4800 grahics.